GameChanger cap made of lightweight performance fabric. 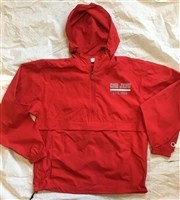 Khaki with Cor Jesu Academy in red lettering on front, Est. 1956 on back, black accents on bill, button top and eyelets. Slide buckle closure on back for adjustable fit. 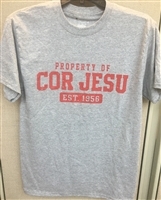 Cor Jesu baseball tee from Under Armour has 3/4 length sleeves in heather gray with red arms and neck trim and Cor Jesu script across the front. Charged cotton 4-way stretch fabric wicks sweat and dries fast. Side vents and droptail hem. Available in sizes S, M, L, and XL. 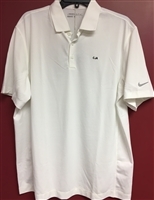 These are men's sizes so order appropriately. Ultralight Boonie hat is great for outdoor activities! Provides UPF 30 (ultraviolet protection factor) to protect your face and neck from the sun. Lightweight fabric with adjustable drawcord and performance sweatband provide a perfect fit. 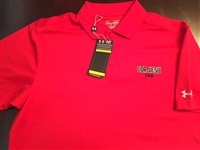 Khaki with red trim and Cor Jesu Academy embroidered logo. Champion reverse weave crew sweatshirt. Heavyweight fleece in a 80 / 20 cotton poly blend. Has double layer rib knit trim at t neck, cuffs, waist and side panels. A classic!! Available in red with white lettering or gray with red lettering, sizes S, M, L, and XL. (Gray available in XXL) - Gray is temporarily unavailable.